As Barry has also noted over at Search Engine Land, blue doesn’t really seem like “Yahoo”, it seems more like another company. It’s purple (my favorite color) that I think of when I think Yahoo. I thought this was a screenshot of Google’s results page. Interesting…. I’m not sure about the banner header. The blue isn’t doing it for me, either. But it’s the depth of the banner that’s the problem for me personally. It’s robbing valuable pixels from the actual search results, which is why people are there. Style before substance? Tell me it ain’t so! 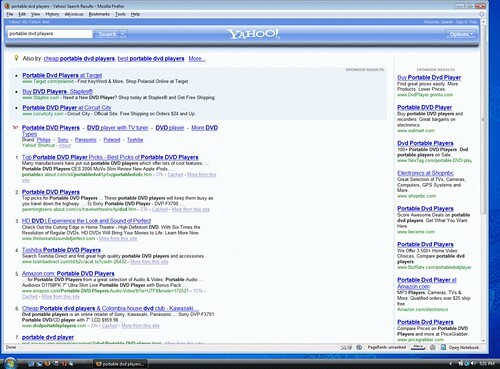 Interesting that both Google and Yahoo are testing a new interface (http://www.techcrunch.com/2007/05/05/google-testing-new-search-results-layout/) at the same time. I also agree about the blue, for one it doesn’t cement well with Yahoos well established brand, and secondly, it has a very “Vista” like fell to the header graphic.